Few years later, Dobie Gillis got involved with a similar family of "health nuts". Sired by Francis X. Bushman, no less. Dunno if this movie was an influence, or the lifestyle of Dwayne Hickman's "Uncle" Bob Cummings. Watching two of my favorite cutie-pies playing sisters again was enough of a draw to check out ATHENA for the first time. Rewardingly goofy in an unintentional ham-handed kind of way. 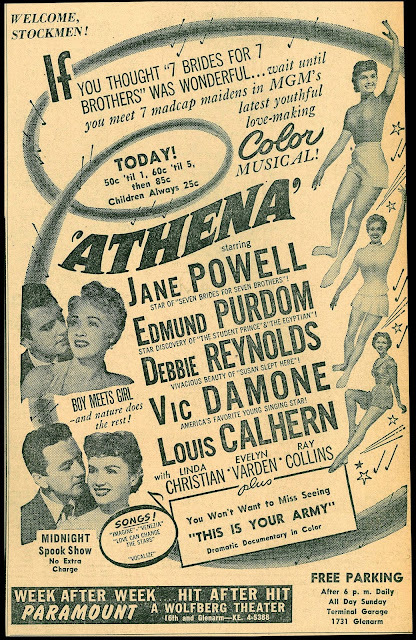 I admit to a fascination with Metro's 'little' musicals of the fifties: every song a little over-produced, every script a little under-written. "Athena" 's no masterpiece. But Jane Powell's always a treat. And the soundtrack (by Blane & Martin, who did the score for "Meet Me in St. Louis") is a charmer. "Love Can Change the Stars" is one of my favorite 50's songs, but, with the rock and roll era dawning, it never really caught on. The film was actually the brainchild of Esther Williams, writer Leo Pogostin and director Charles Walters. And certainly the story of a heroine who's a fitness expert is a natural fit for the magnificently athletic Williams. She and Walters had recently enjoyed working together on the marvelous "Dangerous When Wet", where she plays a channel swimmer. And were eager to team up again. But when she returned from a maternity leave, Williams found out that studio bosses had hi-jacked the property and refashioned it for Powell and Reynolds. Esther was understandably annoyed. After a decade as the studio's most reliable box-office draw, she made only one more film for MGM (the under-rated sword and sandal musical "Jupiter's Darling"),then she and Metro parted ways. I had forgotten all about this film! Jane Powell had to be the sweetest thing to ever come out of the MGM star factory. It seemed like the studio wasted their efforts pushing Kathryn Grayson when that attention should have been directed towards "Janey". 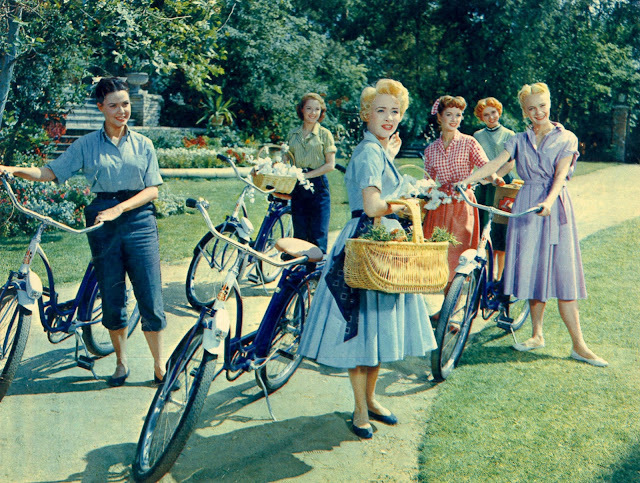 I like Kathryn Grayson and Jane Powell equally. Though Powell is probably the bubblier of the two. To my mind, MGM did a pretty good job of packaging and promoting both. Only wish Universal had been half as assiduous at guiding the career of their soprano charmer, Gloria Jean. Durbin got the prime budgets; the studio even splashed out pretty liberally for Susanna Foster, at least for awhile. I liked Gloria best of the three and she certainly added a lovely twinkle of her own to Fields' "Never Give a Sucker an Even Break" in '41. But thereafter the studio shunted her from one jerry-built cheapie to another. It would have been great to see her showcased with some of the Technicolor splendor Metro regularly lavished on Grayson and Powell. Unlikely to happen at Universal, though. Aside from the fact that studio pockets weren’t as deep, they didn't seem to have a clue how to nurture terrific musical comedy talents like Donald O'Connor, Ann Blyth and Jane Frazee. At least the first two found some movie musical redemption at Metro in the 50’s. Frazee wound up catching what work she could at Republic, then in shorts. Eventually she just quit and went into real estate.